Hyenaz‘s Mad Kate & TUSK teamed up with Alexander Geist to curate an out-of-this-world podcast featuring more genres than we can list, making the whole mix a journey into challenging and beautiful music. 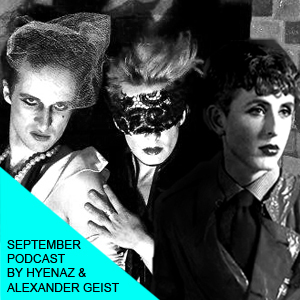 To see more from this podcast team, you can catch Alexander Geist playing La SALE at Underclub in Paris on September 11th, and Hyenaz will feature in Turn Around Bright Eyes, an exhibition by Your Mom’s Agency happening at Berghain on October 15th. Book Alexander Geist and Hyenaz for DJ or live sets worldwide HERE.